The Feb. 3-5 visit of Pope Francis to Abu Dhabi in the UAE is the first papal visit to the Arabian Peninsula. 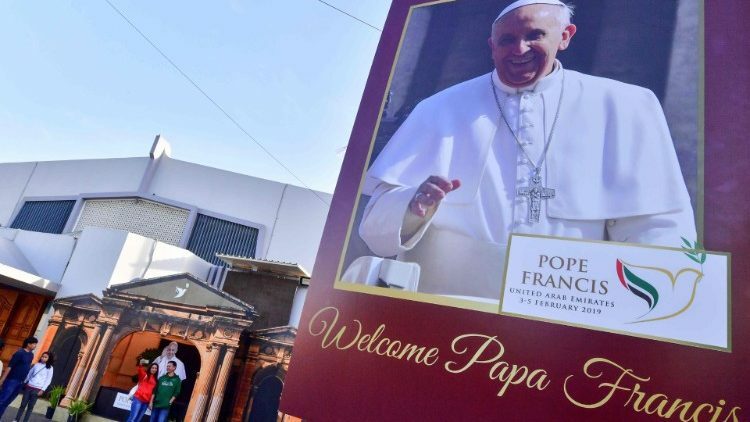 Thousands of Catholics are queuing outside churches in the United Arab Emirates (UAE) for tickets to the first Holy Mass by a pope in the Arabian peninsula next week, local media reported. Pope Francis will arrive in the UAE capital, Abu Dhabi, late Sunday night. The theme of the Feb.3-5 papal visit is, ‘Make Me a Channel of Your Peace’. This will be the Argentine Pope’s 27thforeign apostolic visit outside Italy. The highlight of this trip will be a Mass by the Pope in the morning on Tuesday, February 5, at Abu Dhabi’s Zayed Sports City, which some 135,000 people are expected to attend. The ticket will not only grant the thousands of faithful access to the papal mass in and around the stadium, but also a day off work. The leave was announced by the Ministry of Human Resources and Emiratisation and underlines the UAE’s ongoing dedication to facilitating interfaith dialogue which also coincides with its Year of Tolerance 2019. Ticket seekers are showing a lot of patience and determination to get access to the rare occasion of a papal Mass. “There was already a long line by around 4:30 p.m., even though ticket distribution started later at 6 p.m.,” said church volunteer Lucy Pascua, who was guiding the crowds at St Mary’s Catholic Church in Dubai on Tuesday. Approximately 36,000 tickets have to be distributed to individuals by the end of Friday, Pascua said. There are 1 million Catholics living in the UAE according to estimates by the Apostolic Vicariate of Southern Arabia (AVOSA), the official Catholic Church jurisdiction in charge of UAE, Oman, and Yemen. With a huge demand for the 135,000 seats available for Tuesday’s Mass, names were selected from a draw, often with only one member of a family being granted access to the Mass. A multinational 120-member choir comprising of singers from 9 churches of the UAE has been formed to sing at the Papal Mass. It will be accompanied by an organ and a ten-member brass ensemble. The choir members are from among 283 singers from 120 church choirs who appeared for auditions. They include Filipinos, Indians, Lebanese, Syrians, Jordanians, Armenians, French, Italians, Nigerians, Americans, Indonesians, Dutch and Argentinians. The choir will be led by Joy Santos of the Philippines.